Wherever there is a construction project, you are likely to find a Mutual product. Mutual is continually expanding its product line and developing new products to meet the ever changing needs of the construction industry. 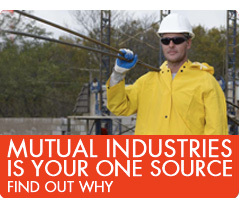 Let Mutual assist you in solving your construction/safety application problems by using their demonstrated technical support, quality products, and on-time deliveries.